Families and students, refugees and artists, young professionals and immigrants, the well-to-do and those in need – an eclectic mix of people live and work in Newtown. Such diversity presents unique challenges in the compact suburb. Cue the Newtown Collective: a co-op made up of local organisations that tackle community issues and create a better space for people to live. Two years ago, Newtown experienced some major changes: the closing down of the WINZ office in Kilbirnie meant the Newtown office was the only facility for Wellington’s eastern and southern suburbs; the South Wellington Mental Health Team moved in; the Salvation Army built a big new facility with a drop-in centre and addictions unit. Ray Tuffin, who helped bring the Newtown Collective together, says these shifts brought in big volumes of people on the streets. “People who were unwell, begging became an issue, breaching of the alcohol ban and a growing number of aggressive behaviour incidents were being reported,” he said. The City Mission, St Vincent de Paul, The Salvation Army, Newtown Residents Association, Newtown Festival, Kia Ora Newtown, Newtown Community Centre and St Thomas Church joined forces to hold activities to engage the whole community, in particular those in need, isolated and homeless. Since its formation a range of activities and functions have been put on: high teas, choir groups, Christmas picnics and more - all with the mantra of ‘total inclusivity’. “The results have been remarkable: begging on the streets reduced dramatically, people from all walks of life connecting on the streets, barriers between the community were broken down, aggressive behaviour was reduced,” Ray says. One of the most successful projects has been the Bloom community centre. 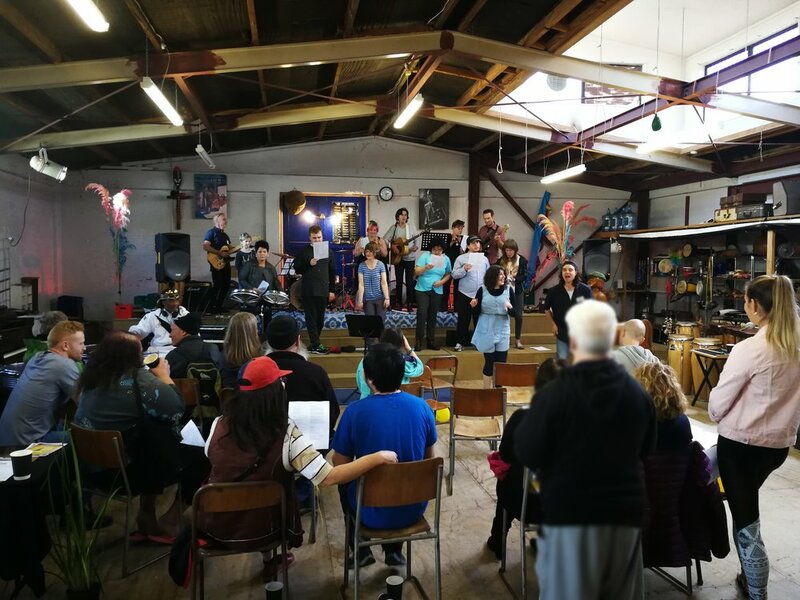 Artists and musicians have transformed the disused Salvation Army store on Rintoul Street into a thriving wellness centre. A mental health percussion band gathers weekly in the space and a weekly choir group with singers from mental health, special needs and addictions units attending. Millie Lambess of St Vincent de Paul’s says all of the organisations involved in the Collective exist to help people one way or another. Salvation Army’s corps officer Lachlan Marshall says the strong sense of community helps everyone connect and have a sense of belonging in Newtown. He has high hopes for the Collective to continue creating community health and resilience.